This weekend we had a cookout with some of our friends from church and decided we’d bring a good coleslaw to go with the bbq type meats everyone would be cooking. So we decided to do a punny version of coleslaw and bring cornslaw. I started dreaming it up because every summer for the past four or five years, Matt and I have inadvertently gravitated toward a Corn Dish of the Summer. A few years ago it was an amazing creamed corn, a year after that it was Esquites (a bowl full of the equivalent of Mexican street corn) and last year it was this amazing miso buttered corn with scallions and bacon, a la Momofuku. 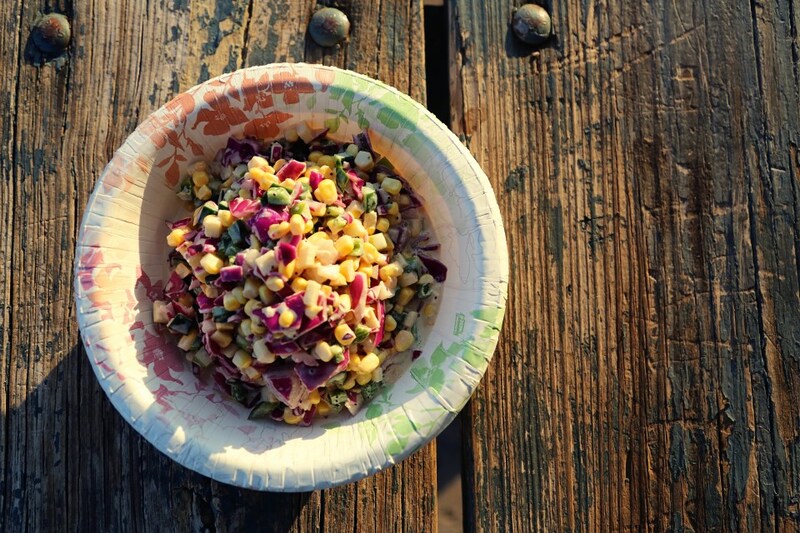 Now, I’m not saying this is THE corn dish of the summer of 2014, but it’s a start. We really like it. To compliment the sweetness of the corn, I added a Granny Smith apple and poppyseeds. To offset the sweetness, I added plenty of purple cabbage and red onion and fresh poblano peppers – everything diced the same size (that’s important). Then, I made my own mayo because we had just run out and I didn’t remember it the TWO times I’d been to the grocery store that day. I was not going back. So, homemade mayo with a little dijon and brown sugar and sherry vinegar – the perfect sauce for our perfect summer slaw! This stuff was fantastic as a side for smokey sausages on the grill (and grilled bread, of course!) 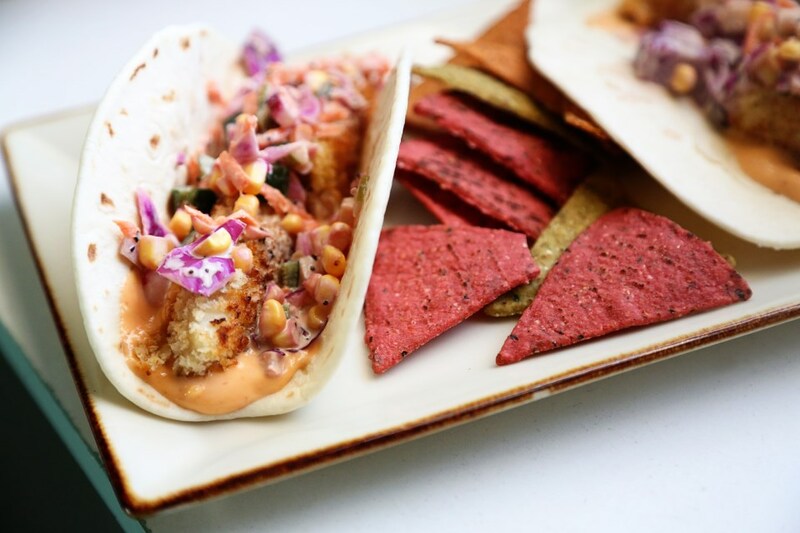 Tonight, I made fish tacos and made a little Srirracha mayo with the leftover batch of mayo from the slaw and topped our tacos with the still-crunchy slaw. Amazing! Welcome to summer, my friends! In a large bowl, cut all the corn from the cobs directly into the bowl. Add cabbage, peppers, onion, carrots, apple and poppyseeds and stir to combine. In a smaller bowl, mix together the mayo, mustard, vinegar and brown sugar and fold into the corn mixture until everything is coated. Season to your taste with salt and pepper. If you want to make your own mayo, I’ll give you our super easy recipe below! Happy cooking! Add the eggs, mustard, vinegar and salt to a large cup and add the oil (if using an immersion blender). Start processing as you gradually lift the immersion blender up, letting the oil get sucked under in a steady stream. If using a food processor, add everything except the oil to the processor or blender and blend for 30 seconds. While running, slowly drizzle the oil in a thin, steady stream until all the oil is added and the mixture is smooth. Pat the fish fillets dry with paper towels and season each side with salt and pepper. Cut into fish-stick sizes (mine were about 3-4″ sticks) by cutting the fillet across it’s width. Put the beaten egg in a large bowl and the panko and seasoning mixed together in a separate bowl. Dip each stick into the beaten egg and then roll in the panko/Old Bay mixture and pat on all sides to fully coat. Lay the coated fish sticks on a clean paper towel while you finish the others. In a large, non-stick skillet over medium-high heat, add about 4 TBS of olive oil and let it heat till it shimmers. Add the fish sticks without crowding (I had to do two batches) and fry till golden brown on each side. Keep warm and crisp in a 250F oven until ready to assemble the tacos. Dollop some srirracha mayo (there’s no recipe here – just add srirracha or any hot sauce to mayo and mix it up till it’s a heat level you like! Mine was about 2 TBS per cup of mayo) along the center of a soft-taco sized tortilla. Lay two fish sticks on top of the mayo and then top with the cornslaw. Enjoy! 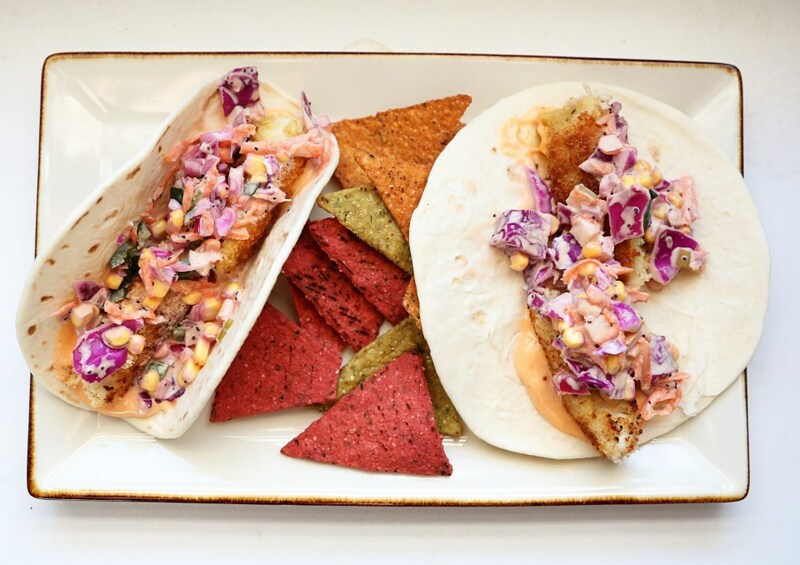 This entry was posted in Appetizers, Fish, Healthy Meals, Side Dishes, Snacks, Uncategorized, Vegetables and tagged cabbage, coleslaw, corn coleslaw, dinner, easy dinners, fish tacos, healthy meals, homemade coleslaw, homemade mayo, poblano, srirracha mayo, summer recipes, weeknight dinners. Bookmark the permalink. 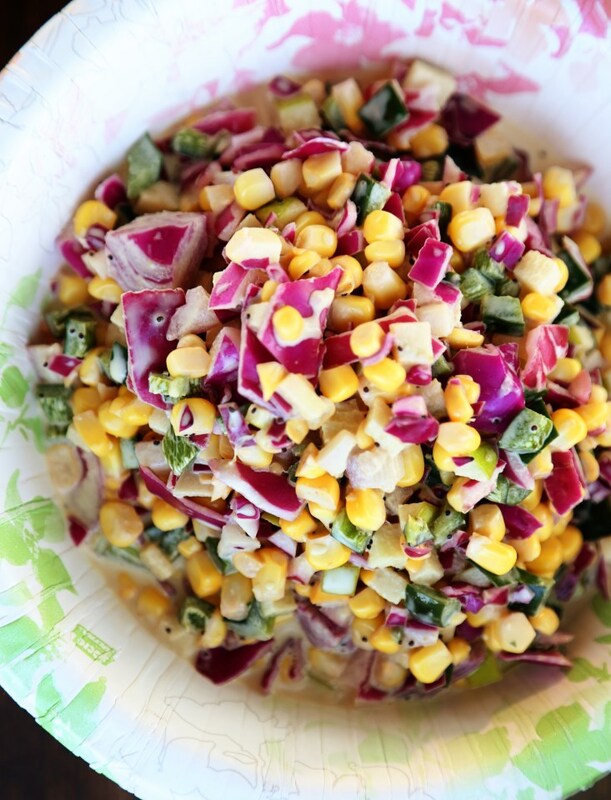 Thanks for sharing this neat slaw recipe! I made it for my family reunion, and it tastes great. I love the combination of favors. Thank you for reading, Sara! I’m glad your family liked the flavors! Kinda different but refreshing! Hope you guys have a great weekend! Do you cook the corn? Nope! We have really sweet corn in the summers around here (Lubbock, TX) and it’s so good fresh! It’s also much more crunchy that way!